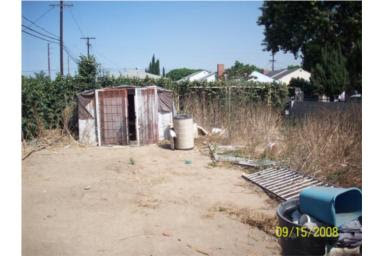 "Good size cemented side yards good for entertainment." Whee. I can hear the champagne bottles popping already. I'm sure that if they just hung some randomly placed twinkle lights, that yard would be positively magical at night... right up until the first guest tripped over the ladder and knocked their teeth loose. I just have to wonder at the people who write these listings. Seriously, who could look at that barren mess of weeds and junk and think "entertaining"? Either they have a much vaster imagination than I do, or...uh, actually I'm not going write the other alternative I was thinking! Um, those popping sounds you hear? Those aren't champagne corks. Get inside. Now. I think it might work. Get some of those torches, steal a BBQ from down the street and fill that blue pail with Bud. Makes my dancin' shoes itch at the thought. And I suppose that's the "guest house" in the back. Cemented side yards? Is is prison?